Double Scottish Formula Ford Champion, Ross Martin, will benefit from the support of the Scottish Motor Racing Club, to assist with his journey to America, where he will compete against 19 other champions from around the globe in the Mazda Road To Indy shoot out on 8th and 9th December. The announcement of this support, follows the conclusion of a recent survey of Scottish Motor Racing Club racing members, where 83% of respondents said they believed the SMRC should have a programme of support in place for drivers. It also marks the start of a commitment from the club to support it’s promising talents in 2019. 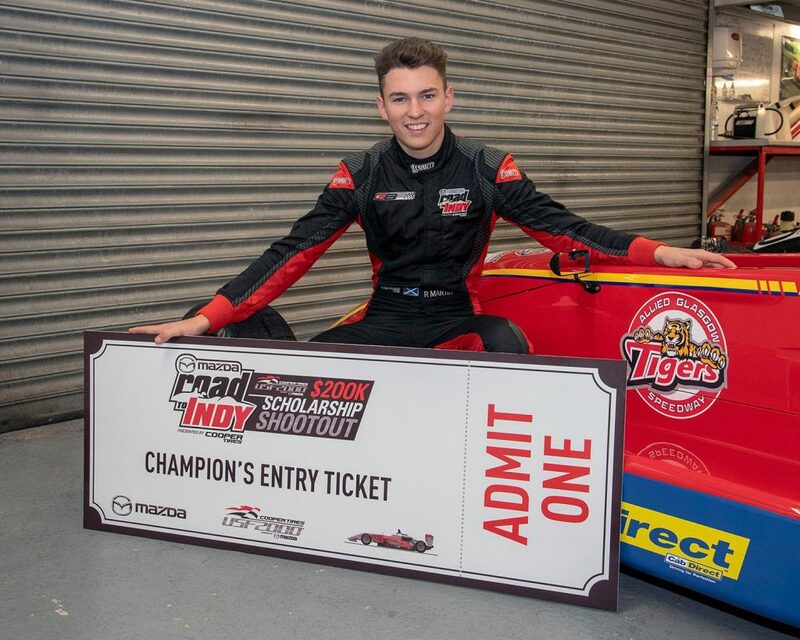 Ross has been the dominant force in Scottish Formula Ford this year; a 100% win record ensured that he finished the season at the top of the points table, putting a second Scottish Formula Ford Championship to his name and earning ‘Champions Ticket’ to the coveted Mazda Road To Indy scholarship. Ross leaves for America today (6th December) where the Bondurant Racing School near Phoenix, Arizona, will play host the third annual event on December 8th & 9th. 20 champions of junior open-wheel series from around the globe will compete for a $200,000 scholarship from Mazda to enter the Cooper Tires USF2000 Championship in 2019 – the first step on the world-renowned driver development ladder system, to reach the IndyCar series. He will face some stiff competition; drivers from the Official Feeder Series in North and South America as well as Europe, Asia, Australasia and, for the first time, the continent of Africa will take part in the shootout. Over 400 drivers have vied for an “entry ticket” to the Shootout, which awards each series’ champion a coveted invitation to the two-day outing. “This is an amazing opportunity for me! Just taking part in the shout-out will be a great experience in itself. To win the scholarship and go on to race the following year in USF2000 will be a huge challenge but it would be an absolute dream come true; I’ll certainly be giving it my best shot! “As a club we feel it is important that we create opportunities for our promising drivers to progress their careers; the result of our recent racing member survey conformed this. Ross has been flawless in the Scottish Formula Ford Championship this year and for this reason, we are happy to make a contribution that enables him to represent our club Internationally. In return, we are looking forward to having Ross’s support next year, where he will help us with some promotional initiatives to help raise the clubs profile. Keep an eye on our social media channels to keep up to speed with Ross’s progress.